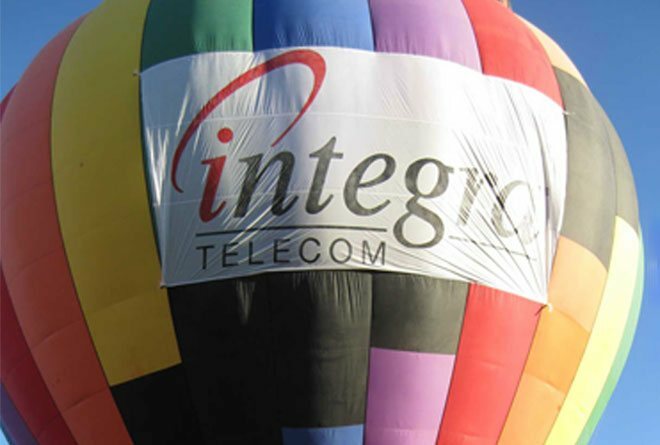 As an industry, any reputable balloon company will charge between $175.00 and $275.00 per person. However, some businesses offer special gift certificates that could lower the price. 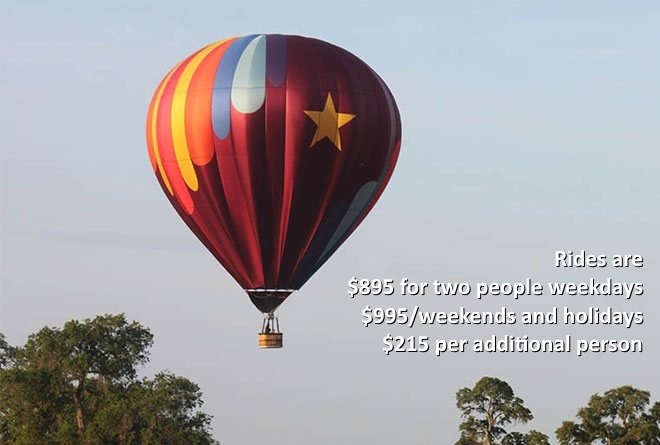 Being FAA certified, hot air balloons are very expensive to own and operate. 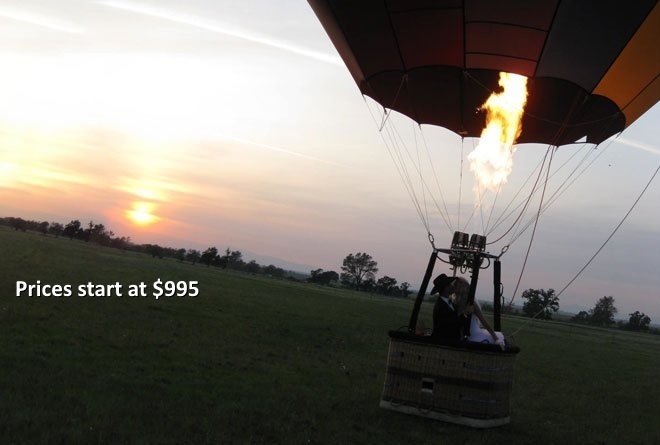 With the cost of: crew, chase trucks, aircraft maintenance and commercial insurance, balloonists strive to keep the cost to the passenger as low as possible. Back in 1786 it cost the U.S equivalent of $45,000 per passenger! 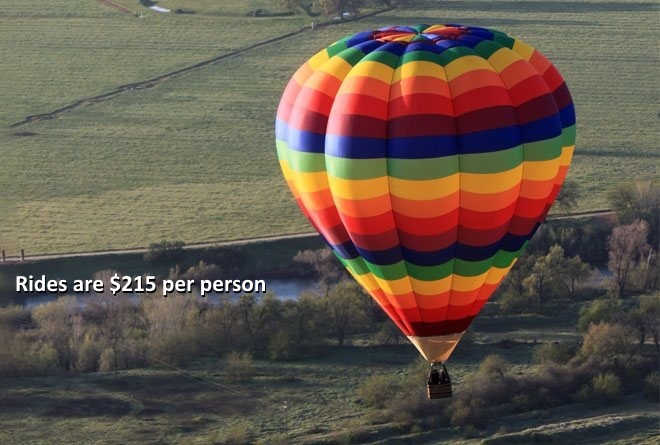 Ballooning is less expensive than ever. Prices will vary from one Balloon Company to another, so it is best to contact the business directly regarding prices and offers. The most popular size is about 55 feet wide and 7 stories tall, using close to 1800 sq. yards of nylon fabric, 3 miles of thread, a 1/2 mile of reinforced nylon webbing (load tapes), and holds about 90,000 cubic feet of heated air. 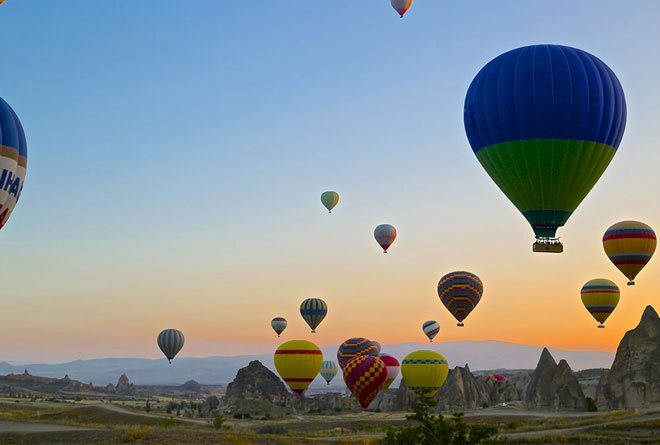 “Special shape” balloons and commercial balloons’ can range in size from 150,000cf to 300,000cf, to accommodate larger baskets and more passengers.The size depends upon how many passengers the company is trying to fly at one time. Some balloons hold as few as one person others as many as 32 passengers. You can get involved with a local pilot and a local balloon club like the Southern California Balloon Association or the Pacific Coast Aeronauts in Northern California. Many enthusiasts get their start as a member of a chase crew. If you live in Northern California or Sacramento’s Gold Country, e-mail us or call us to ask how you can become a member. You might earn free flight time and/or training as crew member! The highest hot air balloon flight on record went to an altitude of 22,000 ft. However, the typical romantic or pleasure flight would fly from treetop level to a few thousand feet, depending on the wind speed and direction. 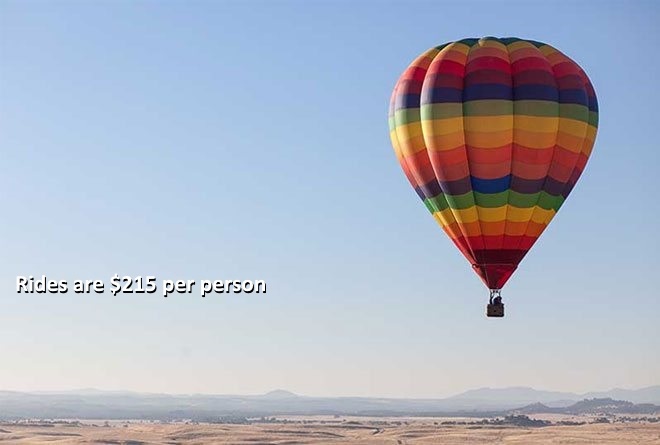 Some hot air balloons can hold up to 30 passengers. 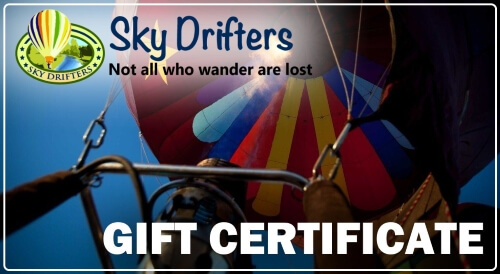 Here at Sky Drifters we have chosen to keep the experience personal and limit the size of our balloons to a maximum of four to eight passengers. Hot air balloons vary in both envelope and basket sizes. Contact the ride company you plan to ride with for questions regarding the number of passengers you will be flying with. Weather is a very important factor in hot air ballooning safely. Winds both on the ground and aloft, temperature, pressure systems, rain and fog all play crucial roles in a pilots decision to fly. Most commercial ride companies require passengers to call-in the day before a flight to check weather conditions. If a flight is canceled due to weather, Sky Drifters will reschedule the flight for another day or may offer a refund if another day is not available. BEWARE of companies that sell rides that are NOT refundable if there is a weather cancellation. WHAT WILL A PASSENGER SEE DURING A PLEASURE OR ROMANTIC FLIGHT? Rolling Northern California foothills and heritage ranch lands! Depending on the flight direction, passengers will see beautiful vineyards, wild land conservation areas, lush green farms or all of the above. In the morning hours native wild life is incredibly active, giving passengers a chance to view herds of deer, coyotes and ducks among many other species. Bring your camera and plenty of space for pictures!